Last year in North Carolina the Academic Standards Review Commission (ASRC) was charged with replacing the Common Core State Standards (CCSS). The North Carolina General Assembly voted to replace Common Core, and the ASRC was expected to come up with alternatives to Common Core. Unfortunately, that did not happen. Although the findings in the ASRC draft report of the commission (located here) clearly indicated that the standards needed to be replaced– such issues as age-appropriate materials, lack of teaching materials, and excessive testing were mentioned–the ASRC simply ignored their own experts and did not replace CCSS. So what are the results of Common Core in North Carolina, and what are the alternatives? The results are awful, and there is one vetted and time-tested alternative. Beginning in 2011, graduating seniors across the nation averaged a 20.6 in English, 21.1 in math, 21.3 in reading, 20.9 in science, and 21.1 composite. By comparison, North Carolina students averaged a 21.2 in English, 22.4 in math, 22.2 in reading, 21.4 in science, and 21.9 composite. Obviously, North Carolina scored well among the states and things were looking up. However, since 2011, things have gone downhill. 2015 graduating classes looked like this: (NC/National) 17.6/20.4 for English, 19.5/20.8 for math, 19.2/21.4 for reading, 19.0/20.9 for science, and 19.0/21.0 composite. Moreover, this is not just a dip in the scores. They have been steadily declining during the five-year period. Obviously, something is amiss or, at least, not what is being claimed. While National scores have remained fairly flat, North Carolina’s have tanked. Since the focus is on readiness for careers and college, other data is included in the ACT report for who is ready for what. Some of the key pieces of data in the report are the “benchmarks” which depict the level at which a student should perform in order to succeed at a specific career or a given college. The benchmarks are listed for each of the subject fields tested, i.e. English, math, reading, science, and composite. Benchmarks are useful for selecting a particular college, getting scholarships, determining career fields, etc. For the graduating classes of 2015, a full twenty-five percent of North Carolina students scored a benchmark in English of 0 to 12 (range of 1-36). Another seventeen percent scored 13 to 15, and twenty percent scored 16-19. This means that a total of sixty-two percent of our students in 2015 scored benchmarks that might, repeat might, get them into a community college. Only nine percent scored in the top two brackets, 28 to 32 and 33 to 36. For the math benchmark, the figure was sixty percent in the lower three brackets, reading was fifty-five percent, and science was fifty-four percent. In order to succeed at any of the major North Carolina Universities and colleges, current ACT benchmarks are NC State 24 to 29, UNC 21 to 26, Wake Forest 29 to 31, Campbell 17 to 27, East Carolina University 20 to 24, and UNC-Charlotte 20 to 25. If a student with an ACT of 19 were to apply to UNC-Charlotte, it is estimated that they have a fifty-five percent chance of success while the same score would only have a twenty-three percent chance at Campbell University. Along with the falling scores, there has been little to no progress in closing the learning and achievement gaps for minority students. Students of color are worse off with the CCSS standards, not better. Their parents ought to be outraged at the lack of appropriate content. As for “career ready” there is a “World of Work” map for careers that supposedly matches ACT scores with various occupations. Given the narrow aperture that the rest of the ACT/CRS process uses, one can only imagine how well the map works in determining a career for students not planning to attend college. What ever happened to guidance counselors working with parents to help choose a career? In conclusion, our public education system imposes a set of standards on its students and their parents, has designed a testing apparatus totally aligned with the standards and developed to supposedly reveal what career students should consider or what college to attend, and touts this as an improvement. However, data gathered and reported by its own testing shows the results to be dismal and failing. How can the Chamber of Commerce and other interested parties believe that they will be getting better employees for their members? How can colleges believe that their incoming classes of students will not require more remedial classes? So why in the world are we stuck with Common Core? There is a lot of serious money behind Common Core. Bill Gates is one of the primary forces behind Common Core. As I have previously reported: On September 21, 2013, (according to The Washington Post), Bill Gates stated, “It would be great if our education stuff worked, but that we won’t know for probably a decade.” It is becoming very obvious that it doesn’t work! Just for the record,The Daily Caller reported in March 2014 that the children of Bill Gates attend a private school that does not use Common Core standards. Common Core for thee, but not for me. So what is the alternative? The North Carolina Education Coalition has created the North Carolina Education Plan. It is based on two vetted and very successful standards in two different states–Mathematics based on the Minnesota Standards (which the draft resolution of the ASRC recommended) and English Language Arts (ELA) is based on the Massachusetts standards as developed by Sandra Stotsy, credited with developing one of the country’s strongest K-12 ELA programs in Massachusetts. Common sense would dictate replacing something that has failed with something that has been successful. Unfortunately, in the North Carolina academic hierarchy, money has become more important than educating our children. 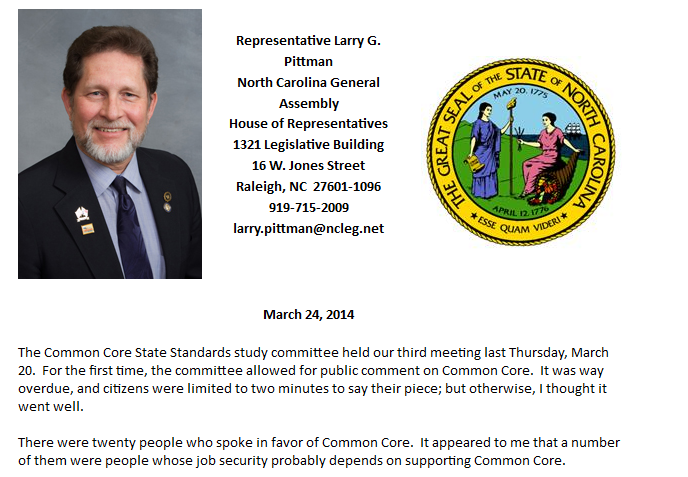 Many of the people in charge of education in North Carolina have a vested monetary interest in Common Core. We will not get rid of Common Core unless parents stand up and demand that public education in this state be controlled by common sense rather than money. We also need to replace any people involved in education in North Carolina who will make a profit through the implementation of Common Core. I was one of several attendees at the ASRC Event today. The pro Common Core member of this commission who was the architect of what took place today was brilliant. First, the order of the meeting to pass all the ELA Sub Committee’s recommendations with unanimous votes. Of course there was nothing contentious in these recommendations, since the best I can tell, it merely restated the S812 bill expectations of this committee. The committee met for 15 months to simply send back to the General Assembly a restatement of their assignment? The General Assembly will no doubt be impressed! But what happened next was the genius part. Making what appeared to be a friendly recommendation to improve on the Math Sub Committee’s recommendations in the “Draft” document. It was even stated, this can only reinforce the Math Sub Committee’s recommendations. All this took place before the documented recommendations for the math were even allowed to be discussed. Then witnessing the aggressive attack on Dr. Scheik, whose sub-team did more real work on evaluating standards than the original authors of CCSS, that resulted in failure of all those recommendations to pass the committee vote. This is when it became crystal clear to me why there was such a push to copy the ELA recommendations to the Math recommendations! Since none of the math recommendations passed during the voting process, the commission would have had NO math recommendations in their final report. Absolutely brilliant! I referenced this as an event in lieu of a meeting, since it was so well orchestrated. I was impressed by the leadership exhibited in the meeting today by Dr. Scheik, who held to his principals to the bitter end against all odds. It is disgraceful that this commission would work for 15 months on an assignment to make recommendations and have other members who took no part in the work team, ambush them in this manner. Real leaders would have done the hard work through the process to develop recommendations of substance, that were acceptable to the majority. Instead, they just hung around and waited for the opportunity to snipe the work. With this level of leadership (that includes two State School Board members), it is no surprise to see their steadfast resolve to stay the course on a failed process. I feel really bad for those commissioners who worked their heart and soul to positively impact the education of our great state of North Carolina, only to have it erased in such a circus event. I know this was a huge personal sacrifice for those people. This is far from over since the future of our children is worth fighting for. On Monday, I attended the monthly meeting of the Academic Standards Review Commission (ASRC). The Commission has worked hard, but unfortunately, the Commission has been trying to re-invent the wheel rather than draw on what has already been successful in North Carolina and other states. A group of educators has put together the North Carolina Education Plan, which is based on standards that were successful in other places. Minnesota (pre-Common Core) math standards have proven to be successful and Massachusetts (pre-Common Core) English standards have proven to be successful. The North Carolina Education Plan builds on these successes. Parents have expressed their dissatisfaction with Common Core–the excessive testing have created unnecessary stress in young children and children who loved going to school now dread going. There is also the issue of data mining, privacy violations and unfunded mandates in terms of electronic equipment in future years. Common Core is a horrible program backed by some people with very large sums of money. It is time for parents to get together and make their voices heard. An initial draft of the ASRC’s recommendations for both ELA and Math was presented. There were 8 ELA and 11 math draft recommendations. Of note in the draft ELA recommendations was recognition that the Common Core as it stands is not age/developmentally appropriate, “ELA standards need to be revised or rewritten to be developmentally appropriate for the students“. Overall, the consensus has been that the integrated math under Common core is not only confusing but insufficient for students wishing to advance to a four year school. For the K-8, the recommendation is to totally chuck Common Core. The ASRC would do well to take a good look at the North Carolina Education Plan. It would save the state a lot of money and the parents in the state a lot of aggravation. Breitbart.com posted an article yesterday about a grassroots group in North Carolina called the North Carolina Academic Freedom Alliance. The group was formed to fight Common Core standards in North Carolina and to suggest the North Carolina Plan as an alternative to the government and big business controlled standards of Common Core. Their research involved reviewing some 3,000 pages of standards to find the “best of the best.” The final product consists of a remodeling of the Minnesota math standards and the 2001 Massachusetts ELA standards. The Plan, however, debuted on March 7 at a forum sponsored by the North Carolina Academic Freedom Alliance in New Bern. The event, titled “An Educational Forum for the Replacement of Common Core,” was attended by Freedom Works, Americans for Prosperity, and the John Locke Foundation. The North Carolina Plan would be the best option for education in North Carolina. The problems with Common Core are too numerous to list here, but they include intrusive information gathering on students and their families, extensive testing that stresses out our children and does not accomplish anything, and material that is not age appropriate for the children. The North Carolina Plan does not have any of these problems and will encourage students to practice critical thinking after they graduate from school, making them more informed and more productive citizens. Yesterday The Washington Post posted an article about the Common Core requirement that Kindergarten children learn how to read. The Common Core State Standards call for kindergartners to learn how to read, but a new report by early childhood experts says that forcing some kids to read before they are ready could be harmful. Two organizations that advocate for early childhood education — Defending the Early Years and Alliance for Childhood — issued the report titled “Reading in Kindergarten: Little to Gain and Much to Lose.” It says there is no evidence to support a widespread belief in the United States that children must read in prekindergarten or kindergarten to become strong readers and achieve academic success. I think most of us would agree that we want our children to become strong readers and achieve academic success. I think most of us would also agree that there are some children who might actually be ready to read by kindergarten. However, not all children are ready to read by Kindergarten, and are we ready to accept the damage that we will do to those children in the name of Common Core? Many children are not developmentally ready to read in kindergarten, yet the Common Core State Standards require them to do just that. This is leading to inappropriate classroom practices. No research documents long-term gains from learning to read in kindergarten. Children learn through playful, hands-on experiences with materials, the natural world, and engaging, caring adults. Active, play-based experiences in language-rich environments help children develop their ideas about symbols, oral language and the printed word — all vital components of reading. We are setting unrealistic reading goals and frequently using inappropriate methods to accomplish them. Please follow the link above to the article to read the rest of the findings. It is becoming very obvious that the people who designed Common Core did not allow for individual students or their individual personalities and development. Are you willing to gamble your children’s future on something that is not only untried, but may also be harmful to your children? Fox News posted a story today about some of the lessons given to fourth grade students at Pasodale Elementary School in El Paso, Texas. One of the lessons cited was the story of a wife finding a strange hairclip under her bed with a different color hair in it than her hair. The second lesson deals with a mother learning about the death of her son. In the second lesson, the entire situation does not even accurately describe how the military brings the news to the family of a fallen hero. These are not age-appropriate subjects for fourth grade students. Last year in Arizona, FoxNews.com reported that students at Playa Del Rey Elementary School were asked to read the same passages. In that instance, the teacher hadn’t read the assignment and immediately apologized. The article does not state this, but I strongly suspect that the material is part of the suggested lessons included in the Common Core. There are a number of textbooks that have been written to be compatible with the Common Core curriculum. The best thing that could happen for American students would be for the Common Core curriculum to be thrown out and states be allowed to set their own standards. Hopefully the textbooks adopted after the demise of Common Core will not include the kind of fourth grade lessons shown above. These lessons should be categorized as child abuse. Dr. Marty Nemko posted an article at the Daily Caller on Friday about the Common Core standards (and curriculum) that is currently being debated in many states. Generate two numerical patterns using two given rules. Identify apparent relationships between corresponding terms. Form ordered pairs consisting of corresponding terms from the two patterns, and graph the ordered pairs on a coordinate plane. For example, given the rule “Add 3″ and the starting number 0, and given the rule “Add 6″ and the starting number 0, generate terms in the resulting sequences, and observe that the terms in one sequence are twice the corresponding terms in the other sequence. Explain informally why this is so. Prove theorems about lines and angles: vertical angles are congruent; when a transversal crosses parallel lines, alternate interior angles are congruent and corresponding angles are congruent; points on a perpendicular bisector of a line segment are exactly those equidistant from the segment’s endpoints. Lest you think I cherry-picked, here is the link to all the standards, K-12. Throughout, they are remarkably arcane and irrelevant in the real world. I have no idea what they are trying to do to our children, but it seems to me that learning two plus two and related facts might be much more useful. When I look at the math curriculum of Common Core, it looks like ti was designed by an English major. That is not to knock English majors, but there are some people who will not grasp basic math regardless of what you do to it (I had that problem with physics). I understand that we live in a complicated, computerized world, but I firmly believe that memorization of addition, subtraction, division, and multiplication facts builds a good foundation for learning mathematics. Common core does not build that foundation–it eschews memorization. When you don’t have a good foundation, the building collapses. I fear that we are about to collapse the American educational system by introducing Common Core. Our educational system is not perfect, but I believe that Common Core will make it worse–not better. If your state is considering the Common Core standards, take heart. You do have a voice. If the public speaks out against this federal take-over of our education system, Common Core can be stopped. Today I attended a public meeting of a joint legislative committee in North Carolina that is studying Common Core and will likely make recommendations on its implementation in the state. The Common Core State Standards Initiative is a set of standards for K-12 in English and Math. It will later include Science and Social Studies. It is a top down program coming from Washington, D.C., that is copyrighted and not tailored to meet the needs of each individual state. The Common Core program is heavily funded by the Bill Gates Foundation. There were sixty speakers at the meeting and another forty or fifty in the audience listening to the arguments. 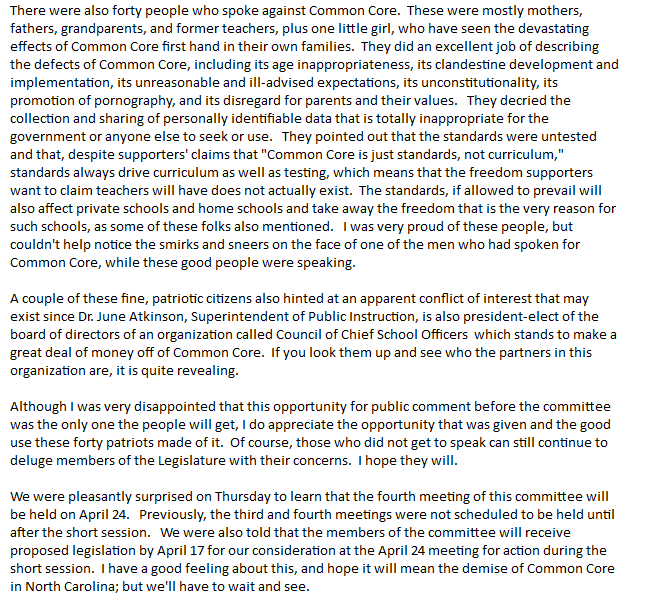 Generally speaking, those who supported Common Core spoke of the need for educational standards. I don’t think anyone would dispute that educational standards are needed–the question is whether those standards will be handled locally or handed down from Washington, D.C. The arguments against Common Core were varied. Some people argued that the dictation of educational standards from Washington, D. C. was unconstitutional. Other speakers expressed concern about the amount of data that will be collected on the students in the Common Core program and what will be done with that data. There was a serious question as to whether privacy rights of students and parents will be protected. The most convincing argument against Common Core came from parents of children in kindergarten through grade three. Those parents were nearly in tears as they described the impact Common Core was having on their children–the children hate school and are suffering anxiety attacks due to the pressure of constant testing. The children are also being asked to understand concepts that are not age-appropriate to them. Two other objections to Common Core were that the program has not been tested and that no one has put a specific price tag on the cost of implementing and maintaining the program. After listening to the statements made this morning, I can only conclude that it would be unwise to implement a set of academic standards without adequately testing them or knowing how much they would cost. I would strongly suggest that the State of North Carolina set its own academic standards by observing other states that have been successful in doing this. Massachusetts (before Common Core) is a very good example of a state that greatly improved its academic standards without any help from the federal government. This is probably the only time I will ever suggest that North Carolina follow the example of Massachusetts, but this is the one time Massachusetts has set a good example. The Heritage Foundation posted an article today pointing out that because parents are become more aware of what the program is, many states are renaming the Common Core program in order to sneak it past the parents. The curriculum is unacceptable to parents for a variety of reasons. Offered more than $4.35 billion in Race to the Top grants. Directly financed the two national testing consortia developing the assessments to test whether students learn according to the standards. Have offered waivers to states from the onerous provisions of No Child Left Behind in exchange for common standards adoption. Have created a technical review panel for the tests housed at the U.S. Department of Education. Parents recognize that Common Core national standards and tests will require them to relinquish one of their most powerful tools to effect school improvement: control of academic content, standards, and testing through their state and local policymakers. Parents recognize that Common Core takes their seats at the table, further removing them from the decision-making process in favor of decisions being centrally made by national organizations and Washington bureaucrats. The last thing this country needs is Washington bureaucrats messing up children’s education. Part of the problem with the education our children are currently receiving is that the involvement of parents in our schools has decreased greatly because of the need for two wage earners in families. Common Core will totally freeze parents out of all decision processes concerning educational standards for their children–these will now be standards set by the federal government that have no room for individuality. Common Core needs to be replaced by a plan that allows states and communities to set educational standards that fit their communities. In education, one size does not fit all.